Nucleon BI Studio (Business Intelligence Studio) is a powerful and innovative business intelligence, data reporting, data visualization, data mining and data analysis software for the relational and NoSQL systems. Using Nucleon BI Studio, you can easily connect to any datasource, analyse and visualize it using provided business intelligence modules and features. 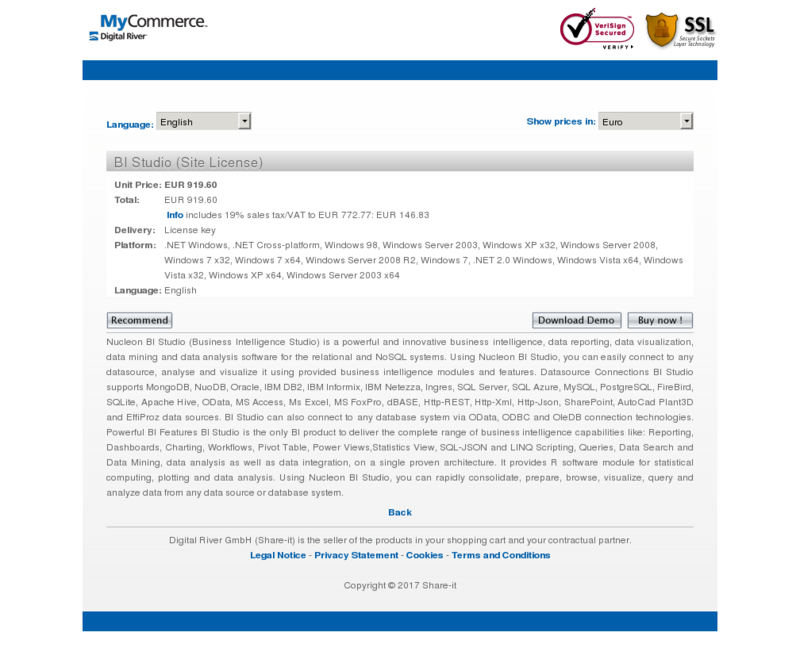 Datasource Connections BI Studio supports MongoDB, NuoDB, Oracle, IBM DB2, IBM Informix, IBM Netezza, Ingres, SQL Server, SQL Azure, MySQL, PostgreSQL, FireBird, SQLite, Apache Hive, OData, MS Access, Ms Excel, MS FoxPro, dBASE, Http-REST, Http-Xml, Http-Json, SharePoint, AutoCad Plant3D and EffiProz data sources. BI Studio can also connect to any database system via OData, ODBC and OleDB connection technologies. Powerful BI Features BI Studio is the only BI product to deliver the complete range of business intelligence capabilities like: Reporting, Dashboards, Charting, Workflows, Pivot Table, Power Views,Statistics View, SQL-JSON and LINQ Scripting, Queries, Data Search and Data Mining, data analysis as well as data integration, on a single proven architecture. It provides R software module for statistical computing, plotting and data analysis. Using Nucleon BI Studio, you can rapidly consolidate, prepare, browse, visualize, query and analyze data from any data source or database system.